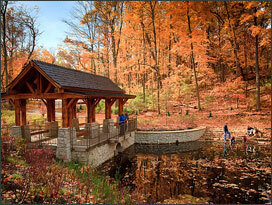 Spend quality time outdoors with your family in your MetroParks. We’ve rounded up some fun and family friendly activities to help you unplug and tune in to Mother Nature. Explore your local natural, historic and cultural treasures together and make lasting memories. From May to June, enjoy observing colorful butterflies at Cox Arboretum while learning about pollination and how families can help nature through growing pollinator habitats. Have you visited this favorite kid spot? Children love to explore the world around them through hands-on gardening activities. Learn about Ohio’s native habitats and create your own adventure in this whimsically themed area on the grounds of Wegerzyn Gardens MetroPark. Don’t miss our What’s New at 2 programs in the garden. Grab your tent and spend a night under the stars with the family in one of our 14 campsites. No flights, no car rentals, no hassles. Camping may be your easiest (and cheapest) family vacation ever. Studies show that outdoor experiences make children more environmentally conscious, help them manage stress and reduce restlessness, boredom and even symptoms of ADHD. 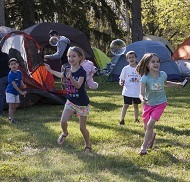 Have fun choosing your campground; each one delivers a unique experience. For families, a good place to begin is Possum Creek. Hills & Dales is the perfect place for a family outing. Nature trails wind through the tree-covered park and offer interesting spots, like Dogwood Pond or the Wetlands Boardwalk, for observation and learning along the way. There are plenty of places to picnic, including a reservable shelter right next to the playground. Kids can move back and forth between the traditional playground and the nature play area. Caretakers can keep an eye on the children while walking on nearby paths or enjoying the comfy Adirondack chairs. The historical farm at Carriage Hill is a great place for families to take in many different aspects of 19th century farm life. Kids can get up close to and pet farm animals, and adults may be interested in attending the weekend demonstrations. From a tot track for those just getting comfortable on two wheels to advanced trails, the MetroParks Mountain Biking Area (MoMBA) at Huffman MetroPark has something to offer to everyone in the family. One of the best things about paddling is that it’s a healthy and fun activity to share with your whole family. It’s also a wonderful way to connect with the natural world. Because paddling doesn’t require a lot of strength it’s the perfect activity for family members of all ages. An easy spot to get started is the Lagoon at Eastwood. Smooth, flat water and an easy access point to put boats in and take them out make this ideal for beginners and those with young children. Take advantage of the great outdoors! Build gardens to attract wildlife. Build gardens to grow food. Build a bird feeding station. Using less air conditioning encourages kids to find the backyard.